Home lawns need watering when footprints remain after walking across them. Cool season lawn grasses, such as Kentucky bluegrass, perennial ryegrass, and the fine fescues, vary in the amount of water needed for good growth. Factors such as the soil, weather, and management practices all have a role in water needs of lawns. In general, about one to 1.5 inches of water per week is needed to maintain green color and active growth. 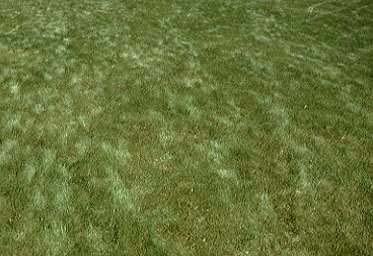 Cool season grasses naturally slow down in growth and may go dormant in hot weather. An important decision you need to make before summer is whether you will water lawns consistently as needed throughout the season, or let lawns go dormant as conditions turn warm and dry. Do not rotate back and forth. In other words, don't let the grass turn totally brown, apply enough water to green it up, and then let the grass go dormant again. Breaking dormancy actually drains large amounts of food reserves from the plant, causing stress and making the grass plant more susceptible to disease. When is it time to water? The first few warm days of summer does not automatically mean it's time to water lawns. In fact, allowing lawns to start to go under mild drought stress actually increases rooting. You can determine stress by watching for footprinting, or footprints remaining on the lawn after walking across it. Grasses tend to turn darker in color as they go under drought stress. Sampling the root zone soil could be another sign of stress. In general, water as infrequently as possible. Water thoroughly so moisture gets down to the depth of the roots. Exceptions to this general rule would be for newly seeded lawns where the surface needs to stay moist, newly sodded lawns that have not yet rooted into the soil of the site, or when patch disease is a problem. Otherwise, avoid frequent waterings, which promote shallower root systems and weeds (i.e. crabgrass). Given a choice, water early in the day when lawns are normally wet from dew. Avoid midday watering. The water evaporates resulting in costing more with less water getting into the soil. Night watering has the potential of an increased chance of some diseases. Spread the water uniformly across the lawn. Sprinklers vary in distribution patterns, and require spray overlap for uniform coverage. Placing coffee cans or similar straight-sided containers on the lawn can help measure water application rates. Avoid flooding areas, or missing other spots. On heavy clay soils with lower water absorption rates and slopes, watch for excessive runoff; it may be necessary to apply the water in two applications to assure it soaks in. Finally, there are some measures to conserve water use by lawns. Mow higher, avoid excess nitrogen as warm weather approaches, limit traffic over the lawn, improve turf rooting, control thatch and soil compaction, and avoid pesticide use on drought stressed lawns. For additional information on managing lawns under drought conditions, see Managing Lawns During Drought.